Fabulous 1BR Apartment, 30sqm terrace and sunshine all day long- for up to 4 person! Casa Eugenia has replaced an old fisherman's house as it has been newly built a few years ago. 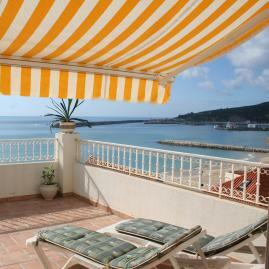 The house is only about 50m from the beach and offers a terrace and view of the promenade and the sea. Apartment Regina is situated on the top floor. With its 30sqm terrace and a gorgeous view to the Atlantic sea this place is ideal for 2 adults and 2 children. But also 4 adults are fine as we have a very comfortable sofabed in the living room.